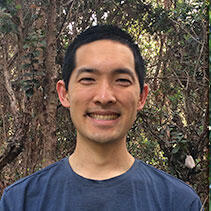 Bryce Masuda serves San Diego Zoo Global as a Conservation Program Manager in Recovery Ecology. In this role, he oversees the Keauhou and Maui Endangered Bird Conservation Centers, 'alala reintroduction program, and aga (or Mariana crow) conservation program. As part of his work with Hawaiian forest birds, Bryce oversaw the initiation of an ‘akikiki and ‘akeke‘e captive breeding program in 2015. During this time, eggs were collected from wild nests and artificially incubated, and nestlings hand-reared as founding members of an assurance colony that will serve as a safety net against extinction. Bryce’s research interests lie in conservation-based questions involving translocations and reintroductions of endemic birds. Prior to joining San Diego Zoo Global, Bryce coordinated translocations of tieke (South Island saddleback) to Orokonui Ecosanctuary in New Zealand, and was involved with translocations of Mohua, Rifleman, and the South Island robin. Bryce is also interested in studying the impacts of exposure of non-target species to anti-coagulant rodenticides following predator control and eradication operations. Bryce feels privileged to be back home in a position to give back and restore the land through the release of endemic bird species back into the wild. Bryce earned his bachelor’s degree in Biology from Linfield College and his master’s degree with distinction from the University of Otago. Bryce has authored a number of peer-reviewed scientific articles and has given numerous presentations. He currently serves on the ‘Alala Restoration Working Group, Kauai Forest Bird Working Group, Maui Parrotbill Working Group, and Nēnē Recovery Action Group. He also advises the Orokonui Ecosanctuary on the management of reintroduced endemic bird populations.